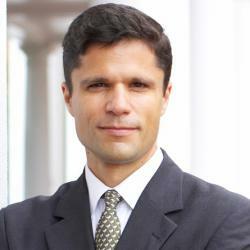 Sean Carr is an Assistant Professor of Business Administration at the University of Virginia’s Darden School of Business and the Executive Director the Batten Institute for Entrepreneurship and Innovation. His applied research, which has examined entrepreneurial dynamics, social networks, venture capital, and financial crises, has resulted in award-winning books, articles, case studies, digital media, and numerous teaching materials. His work has been cited by the New York Times, the Wall Street Journal, the Financial Times, Newsweek, NPR and CNBC; he is also the co-author of The Panic of 1907: Lessons Learned from the Market’s Perfect Storm (Wiley, 2007), with Robert F. Bruner. Previously Sean spent nearly ten years as a broadcast journalist with ABC News and CNN. He has earned both a PhD in Management and an MBA from the University of Virginia; an MSc from Columbia University; and a BA from Northwestern University.